Ca2+ might affect SK channel gating either by binding directly to the channel protein or by binding to a separate Ca2+ binding protein and subsequent interactions with the SK channel. The rapid activation kinetics of the cloned SK channels are similar to the opening rates for ionotropic receptors such as GABAa  or NMDA-type glutamate receptors , where there is a direct interaction between the ligand and the receptor. This suggests that Ca2+ ions directly interact with the SK channel protein to affect gating. Moreover, steady-state Ca2+ sensitivities of all of the cloned SK channels are indistinguishable, suggesting that conserved residues on the predicted intracellular aspect of the channel mediate Ca2+ gating. The cloned SK channels have a half-maximal open probability when exposed to « 0.5 |M Ca2+, consistent with an E-F hand Ca2+ binding motif . Examination of the amino acid sequences failed to detect either an E-F hand or C2 motif [30,31]; also, no sequences are similar to the Ca2+ bowl implicated in Ca2+ binding and BK channel gating . However, if the channel protein directly chelates Ca2+ ions, then negatively charged side chains, from glutamates (E) or aspartates (D) are likely to mediate Ca2+ binding. Site-directed mutagenesis, neutralizing each of the 21 conserved residues on the intracellular side of the channels, failed to alter Ca2+ gating, but results from truncation experiments that progressively deleted regions of the C terminus combined with combinatorial site-directed mutations implicated a region in the proximal C-terminal domain. This highly conserved region of «100 residues could be modeled as a series of a-helices and, contrary to a domain expected to bind Ca2+, is highly positively charged (net +14). The seemingly contradictory fast Ca2+ activation kinetics (function) and positively charged domain (structure) were reconciled by showing that the implicated domain serves as a binding site for calmodulin (CaM). Yeast 2-hybrid tests and CaM binding experiments showed that CaM bound to the CaM binding domain (CaMBD), a region of the channel extending «100 amino acids from the cytoplasmic interface with S6. Binding of CaM to the CaMBD occurred in the presence or absence of Ca2+. However, CaM only bound to the C-terminal subdomain of the CaMBD in the presence of Ca2+. Coexpression of SK channels and mutant CaMs with reduced Ca2+ affinity yielded SK currents with right-shifted, and shallower Ca2+ concentration responses (EC50 «1 |M; Hill coefficient « 2) . These results support a model for Ca2+ gating in which CaM is a constitutively associated subunit of the SK channels. Ca2+ binding to CaM induces a conforma-tional rearrangement in CaM that is transduced to the channel subunits and results in opening of the SK channel gate. Calmodulin is an acidic protein composed of 148 amino acids organized into three domains . The N- and C-terminal globular lobes each contain two E-F-hand Ca2+ binding domains. A flexible linker region connects the lobes. Ca2+ binding is highly cooperative, with binding first occurring at the C-terminal lobe and then the N-terminal lobe. Contributions of the various E-F hands to SK channel gating were investigated by coexpressing the channel sub-units, with CaM containing different combinations of mutant E-F hands. Surprisingly, only the N-terminal E-F hands contribute to SK channel gating; loss of either or both of the C-terminal E-F hands to bind Ca2+ did not alter Ca2+ responses, while loss of either N-terminal E-F hand shifted the response, and loss of both abolished channel function . The complex between Ca2+-CaM and the CaMBD was crystallized . The solved structure revealed a symmetrical dimer consisting of two CaMBDs and two CaMs (Fig. 1), with multiple charged and hydrophobic contact points. The initial 17 residues extending from the membrane interface were not resolved. The CaMBDs consist of a relatively short a-helix, followed by a bend and then a long, extended a-helix. The extended helices from the two CaMBDs are in a close antiparallel arrangement and these interactions are the only ones between the channel domains. Two CaMs encase the CaMBDs. Each CaM is in an elongated conformation and touches three helices, two from one CaMBD and one from the other, forming multiple contacts and tying the CaMBDs together. The N-terminal E-F hands are clearly calcified, while the C-terminal E-F hands are Ca2+ free, consistent with mutagenesis studies. 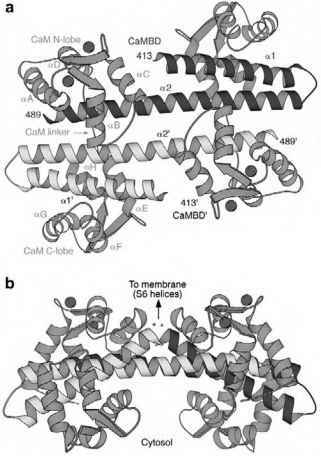 Closer examination revealed that the Ca2+-dependent reorganization of the N-terminal lobe of CaM is similar to other Ca2+-CaM interactions with substrate proteins, where Ca2+ binding to the E-F hand motifs consolidates hydrophobic patches into a larger domain that provides an anchor point for interfacing with the substrate protein [36,37]. These interactions likely underlie the Ca2+-dependent gating process. In contrast, the C-terminal lobe is constrained by multiple interactions with the CaMBD. Several important positions within the E-F hand motifs form strong electrostatic anchoring contacts with the CaMBDs that reorient their side chains so they cannot participate in chelating a Ca2+ ion. The strong C-lobe interactions probably form the basis for the constitutive association between the two proteins. Figure 1 Structure of the CaMBD/Ca2+/CaM complex. (a) Ribbon diagram of the CaMBD/Ca2+/CaM dimeric complex. CaMBD subunits are blue and yellow, CaM molecules are green, and the Ca2+ ions are red. Secondary structural elements, the CaM linker, and the first and last observed residues in the CaMBD are labeled. (b) View of part (a) rotated by 90° showing the orientation of the complex relative to the membrane. Arrow indicates the positions of the first observed residue of each of the CaMBD monomers that are linked to the S6 helices. four-fold symmetry around the pore, at least in the absence of Ca2+. Ca2+ binding to CaM induces the formation of a dimer-of-dimers within the gating apparatus, and this may exert a force on the attached S6 helices that results in opening of the ion-conducting pore. This implies that Ca2+ gating imposes an asymmetry on the pore structure. Interestingly, the initial 17 residues extending from the membrane interface were not resolved in the crystal structure, and this may be due to the ability of this domain to adopt several conformations reflecting the translation of the gating-dimer subunits to the pore. Figure 2 Drawing of the proposed chemomechanical gating model. The cutaway view shows two of the four subunits of the channel (the other two would be in the foreground). For clarity, only the S6 pore helices, the attached CaMBD, and the linker (line) are shown. The CaM C lobe and N lobes are yellow and orange, respectively. In this model, a resulting rotary movement (exaggerated in the figure) would result from formation of the dimeric complex which would drive a rotation between the S6 helices to open the channel gate. S6 [38-40]. However, for the cyclic nucleotide-gated channels that, like SK channels, are gated by binding of an intracellular ligand, it appears that the selectivity filter of the channel also functions as the gate [41,42]. For SK channels, the location and identity of the gate itself remain to be determined, although studies of SK channels using cysteine-modifying reagents are consistent with a model similar to CNG channels, with the selectivity filter also forming the channel gate. 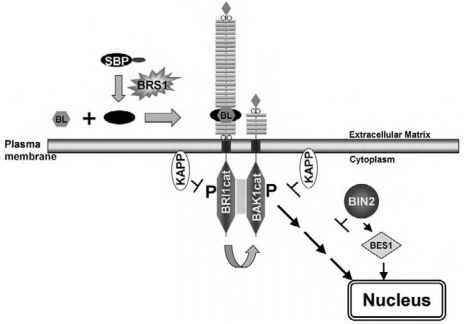 Na+ channels [50; 51], cyclic nucleotide-gated channels , trp (transient receptor potential) channels , and skeletal  and cardiac  muscle calcium-release channels . In addition, a growing list of ionotropic receptors is modulated by direct CaM interactions . Moreover, the consquences of CaM-channel interactions extend beyond biophysical regulation of channel function to nuclear signaling and long-term orchestrated changes in the expression profiles of gene networks [57,58].